You can pick up one of the latest products from UPS Aviation Technologies and get a GPS/com unit, complete with a moving map, or a GPS/navcom unit from GARMIN and add the ability to use the old VHF radio system in addition to your GPS receiver, all in one box. However, for some pilots, the space to install such radios just doesn’t exist. Take, for example, my friend Chuck, who custom-builds aircraft from scratch. The planes Chuck builds— which have included several from World War I — were originally constructed in the days when radios didn’t exist. Staying true to their form requires a relatively close space between the cockpit and the firewall, which doesn’t leave much room for a com radio, much less anything else. What is a custom builder (or even a vintage aircraft restorer) who wants to get more than a handheld into the aircraft’s panel to do? If the option of changing the cockpit design for more space to allow the installation of full-size avionics is not an option, the answer will be surprisingly simple: Go small. Yes; in this day and age of micro-electronics and networked components, there are avionics that can give you nearly all the bells and whistles you could want or, if your home airport is located in Class B airspace, need to operate within the FARs. Becker Avionics Systems caught custom builders’ attention several years ago when it released a line of compact but effective avionics for aircraft. These units, which happen to fit into the tightest spaces, are small, lightweight and operate on 12 volts, which makes them well-suited for projects with large avionics desires but limited avionics space. For example, Becker offers its AR 4201 VHF com radio. The radio fits into a 2 1/4-inch instrument hole and provides 760 channels at 5 to 7 watts output to help other pilots in the area hear your voice. The unit has a built-in supply voltage meter and an optional external temperature sensor that allows the unit to display temperature. On the com side of the radio, the AR 4201 displays the active and standby frequencies, which supports those quick changes in frequency that are required these days. Beyond the expected features, the unit comes with a 99-frequency memory to allow pilots to program in their most-used frequencies. If you compare the AR 420l’s features to other radios on the market, this unit would be pretty much the status quo. However, the entire radio measures 2.25 inches square x 7.6 inches deep. The unit’s tiny size makes it perfect for installation in all but the tightest panels. With some exceptions, this means that you could fit two full corns in your panel and have the instrument space to support it. For those pilots who can’t even squeeze a 7.6-inch-deep radio into their stack or who need more than just a com, Becker also offers its Prime Line II remote-controlled communication and navigation equipment. All the radios you would need for your airplane are literally available in sizes so small that there is almost no panel they couldn’t fit into. This is because all the heads for the units measure a mere 2 1/4 inches in diameter and only 2 ½ inches deep; and all run off either 14- or 28-volt systems! Let’s start with the RT/CU 3209 VHF transceiver as a good example. The Prime Line II com unit will transmit with 6 watts of signal when operating off a 14-volt supply and 10 watts when running off the 28-volt system – enough power to reach out and touch whoever you might need to. The unit’s tiny size makes it perfect for installation in all but the tightest panels. Along with the power, the 760-channel RT/CU 3209 provides the pilot with two frequencies that can be swapped quickly at the touch of a button and up to 20 present frequencies, which are stored in a nonvolatile memory for quick recall while in flight. Of course, a pilot does not navigate by com, so Becker has its Prime Line II RN/CU 5301 nav unit. It’s the same size as the com system, can receive the full complement of 200 nav channels and 40 glideslope channels, and it’s all in one tiny and easy-to-use box. The face-plate of the unit is similar to the com in that it displays two frequencies that can be swapped with the touch of a button and has up to 20 preset frequencies for those frequently used channels. If you were planning a DME in your installation, the unit comes with parallel and serial outputs to support automatic DME channeling. Of course, the steering signals and flag drive outputs are compatible with most of the normally used course-deviation indicator, HSI, flight director and autopilot system inputs. The company also offers a similarly equipped and feature-packed ADF receiver, the RA/CU 3502. With the com and nav sides of the house in reasonably good order, all we need now is a slim, trim transponder to complete the package. The compact Becker 4201 Series 760-channel com radio can fit Into some of the tighter panels In the air today. 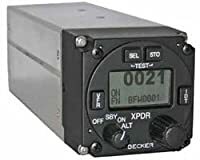 Becker’s ATC/CU 3401 remote-controlled transponder system has the standard feature of an assigned VFR squawk push button, as well as a second memory for pilots who need to squawk an ATIS-assigned code when departing under Class B airspace under VFR conditions. When connected to an altitude encoder, the reported flight level is displayed below the transponder code, allowing the pilot to verify that the system is operating properly. All these units utilize a backlit, double-line LCD display, which was designed by Becker to be readable under all conditions, including direct sunlight. The key to the operation of the compact radio heads is in the remote boxes that drive the various functions of the com, transponder and nav control heads. Much like the avionics used in airline cockpits and larger corporate aircraft, these remote-controlled units must be mounted in a convenient location within the fuselage to support the operation of the control heads. The difference in weight between the control head and the remote units is substantial. The control heads weigh in at around a half a pound, while the remote units vary, generally weighing about 2 pounds. When you compare these weights against those of the latest nav, com or transponder system on the market, they are a little bit heavier on average, but only by a few ounces. The most compact of the discrete radios on the market are the Becker CU 5209 com and CU 5301 nav radios. The tiny wonders work with larger, remote boxes, with the control heads sized to fit the tightest panel spaces. Considering the flexibility the small control heads will afford the installation that is tight for space, the slight weight penalty may be worth it. One other feature of note on these units: All are set up to provide information and interface with cockpit display units (CDUs) and flight management systems (FMSes). This would allow these radios to even be controlled by the FMS or CDU systems, which, if installed, may be one of the reasons panel space is so tight in the first place. Becker is always thinking ahead, so it has provided its own Prime Line remote control unit. The RMU 5000 allows pilots to control up to three different radios from one single 5- x 2.2- x 5-inch-deep control panel. The RMU is available in two configurations. The first supports the com, nav and transponder; the second drops the transponder in favor of the ability to control the ADF receiver. The unit, which uses the same backlit LCD display, has an adjustable back-light and simple, easy-to-use controls. For instance, the face of the unit is configured with active and preset frequencies. To change your com frequency, press the com button, use the dials on the right side of the radio to select your frequency, and hit the double arrow to swap frequencies. The same procedure applies for the transponder, ADF or nav system, making the learning curve fairly shallow. Of course, we’ve covered all the stuff that would be interesting to pilots, except GPS. Becker didn’t forget the hottest trend in navigation; it has manufactured the slender Airscout Voyager GPS receiver for the cockpit. The cockpit display for the Airscout measures 5 3/4 inches wide x 4 inches high x 1 inch deep and offers a full-color, sunlight-readable LCD display. The unit displays your actual position, speed and current track on a detailed, color moving map. As you would expect, the maps for the system will need to be updated on a regular basis. Becker supports those upgrades with either high-speed datalink interfaces connected to a computer or through an optional CD-ROM drive. For pilots who have the urge, a pointing device can be connected to the unit, while an optional infrared interface allows the use of a wireless keyboard for easy route planning and way point programming. Airscout maps are scanned in from the published versions. This means that, as a pilot, you will be seeing the same thing you are carrying with you in the cockpit and not something new invented elsewhere. Rather than having to get used to another map system, you can, instead, stay with the maps you are accustomed to. Just as in its other product lines, Becker has a remote box to drive its 1-pound remote display unit. The remote box is significantly bigger, weighing in at 2 ½ pounds and measuring around 2 ½ x 5 ½ x 8 ½ inches. Running with a 12-channel GPS engine, the designers at Becker are following the standard convention; the system’s unit is set up to support the long-promised wide and local area augmentation systems, which, when development is complete, will eventually bring precision approaches to the GPS navigation arena. If space is truly at a premium, the Becker line of compact avionics is most likely your state-of-the-art salvation. While the company is not as much a household name as GARMIN, Bendix/King, Narco or UPS Aviation Technologies, Becker’s line of compact avionics offers options to pilots who were previously so squeezed by space that they were limited in what they could install. If you need more navigation or communication in a limited panel, the Becker line may be just what you are looking for. While these may not be the latest avionics available from Becker, it certainly explains what is currently available in the world of micro-avionics and communications. Be the first to comment on "Becker Avionics Compact Boxes"